Photo by: PRADD II/Terah DeJong. The proper filtering of the honey led to 50% higher earnings than prevailing market price. Beekeeping is helping cashew farmers in diamond mining communities increase yields and diversify their livelihoods away from dependence on diamonds. Two years ago when the Property Rights and Artisanal Diamond Development (PRADD II) project in Côte d’Ivoire began a beekeeping program in cashew plantations, villagers were skeptical. “You said you want to help us, and now you send us insects that go piquer-piquer (bite-bite)?” said Kone Inza, president of a youth group in the village of Bobi. Now with over 1,000 kilos of honey produced by two dozen beekeepers who have placed hives under the shade of cashew trees, communities in the diamond mining areas of Séguéla and Tortiya are abuzz with excitement. The honey not only sold out within days of harvest, but the bees are also helping increase cashew yields up to 50% on some farms. The PRADD II Project supports governments to implement mining best practices in Côte d’Ivoire and the Central African Republic, and promotes good governance of the mining sector at the international level. As a non-renewable resource, when diamonds are mined out, it often leaves a devastated landscape, full of deep and dangerous pits. In Côte d’Ivoire, however, diamond miners are investing their profits to rehabilitate these unusable lands by filling in the pits and planting cashew trees, responding to high international demand and prices for cashews. PRADD II supports income diversification, such as beekeeping in cashew orchards, in diamond mining communities because cashew production helps mitigate against declining revenues from diamond mining. As a result of participatory action research carried out by the PRADD II team, project staff observed that bees are attracted to the juicy cashew apples and wondered whether bee hives could be placed under the trees. PRADD II learned from the USAID funded African Cashew Alliance that in nearby countries such as Benin, beekeeping can significantly increase the yields of cashew trees, sometimes up to 100%, while also generating highly profitable honey. Thus was born this initiative. Indeed, after reading how beekeeping was used in Benin, Ghana, and Togo to increase pollination and improve cashew yields, PRADD II contacted the national cashew board and the GIZ-led ComCashew project, who agreed to provide valuable technical assistance for a pilot and co-fund an impact study. The results after the first year of testing were presented during a conference in September attended by African cashew research scientists. The study found that raw cashew nut yields in the PRADD II intervention plots were on average 15% higher than control plots—not as high as in neighboring countries, but still promising. A follow-on study to explore how to further increase yields has been planned. 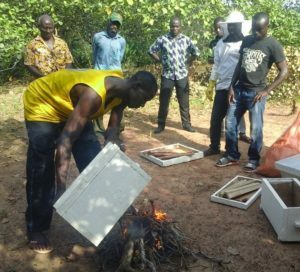 However in the meantime, PRADD II has trained over 50 new beekeepers and is offering incentives to further scale up the pilot, including providing one hive for every hive made or purchased by a beekeeper. PRADD II is closely monitoring the cashew supply chain: after diamonds, cashews are the second most important livelihood in the project’s intervention areas. Satellite imagery analysis shows that cashew trees, introduced as an anti-desertification strategy, covered no land in the late 1980’s but today cover nearly 3,500 hectares in the Séguéla area. 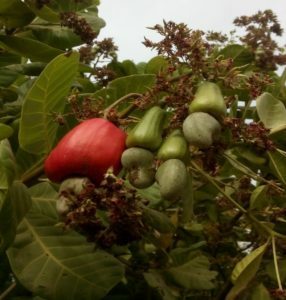 Though cashew nut prices fluctuate on the international market, cashew trees are hearty and drought resistant, providing a more sustainable livelihood for the people that depend on land that has been historically degraded by diamond production. This growth in cashews has led Côte d’Ivoire becoming the world’s largest cashew exporter. Unfortunately however, the country’s cashew nut yields are among the lowest in the world. By introducing bee hives into cashew tree orchards, PRADD II hopes to not only contribute to significant increases in the trees’ yields, but also generate supplemental income for the beekeepers. The boom in cashew tree production is also changing land tenure dynamics as diamond mining areas are converted to cashew tree orchards. Since land uses are rapidly changing, PRADD II is facilitating community land-use planning as well as working with cooperatives to map out farm ownership to secure ownership and prevent conflict. PRADD II has also helped draw attention to the risks associated with the cashew boom through its outreach to national policymakers. The project produced studies showing parallels to the cacao belt, where land tenure conflicts and vulnerabilities stemming from commodity price fluctuations contributed to the country’s 2002-2012 violent political crisis. Productive farms, secure land tenure, and diversified livelihoods are key ways to avoid risks that may lead to conflict. With PRADD II’s support to expand beekeeping, local farmers are better prepared to help mitigate those risks.